There’s no better way of adding a little something to an outfit than reaching for a bottle of nail polish, but what we don’t often think about is if the nail polish is sustainably and ethically made, or if the coloured liquid follows the Breathable, 10 Free formula. Formaldehyde, Tosylamide Formaldehyde Resin & Ethyl Tosylamide, Toluene, Dibutyl Phthalate, Xylene, Triphenyl Phosphate, Camphor, Animal derived ingredients, Benzophenone-1 & Styrene acrylates are the toxins found in nail polish; toxins that can be absorbed through our skin or our mouths and then, ultimately, make their way into our bloodstream. DPB (Dibutyl Phthalate) contains phthalates. In both Europe and the United States, phthalates are listed as suspected endocrine disruptors, meaning they interfere with normal hormone function. As a result, it can affect fertility, cause health issues such as liver and kidney failure in young children, and can also cause developmental defects in unborn children. Toluene is a chemical solvent that is present in paints, varnishes, glues, tar and polishes. It can cause irritation to the eyes, nose and throats, and in moderate to large doses can impact the nervous system, immune system, lungs and organs. Formaldehyde is a key component in embalming fluid used on corpses. It is also often used as a disinfectant, fungicide and germicide, and preservative research has suggested its properties are carcinogenic. It is also known to bring about watery, burning and/or itchy eyes, discomfort in the throat, headaches and tiredness, and can also lead to dermatitis and asthma. Camphor is a plasticiser that is used to give nail polish that glossy finish we all love so much, and this toxin is what we can associate with the sharp smell of nail polish. Because it can result in yellow and brittle nails, as well as liver and neurotoxicity, it has been banned in Canada. Ethyl Tosylamide is another plasticiser that is used to make nail polish dry faster. It’s been banned in the EU for fear of increasing antibiotic resistance. Xylene is what keeps nail polish from drying out and becoming sticky. It’s been labelled as an allergen, irritant and central nervous system depressant. Okay, so now you know why these toxins are very naughty, we want to tell you about a nail polish that is very, very nice. Paint Nail Lacquer is a nail polish that is ethically made, cruelty-free, and 100% free of those ten nasty toxins. Paint’s polishes are also super affordable, completely vegan, and just absolutely fabulous. As the brainchild of an Australian Interior Designer, the Paint collection began with just twelve of the most on-trend colours, and continues to follow this minimal concept with the range consisting only of the new season’s must-have colours. 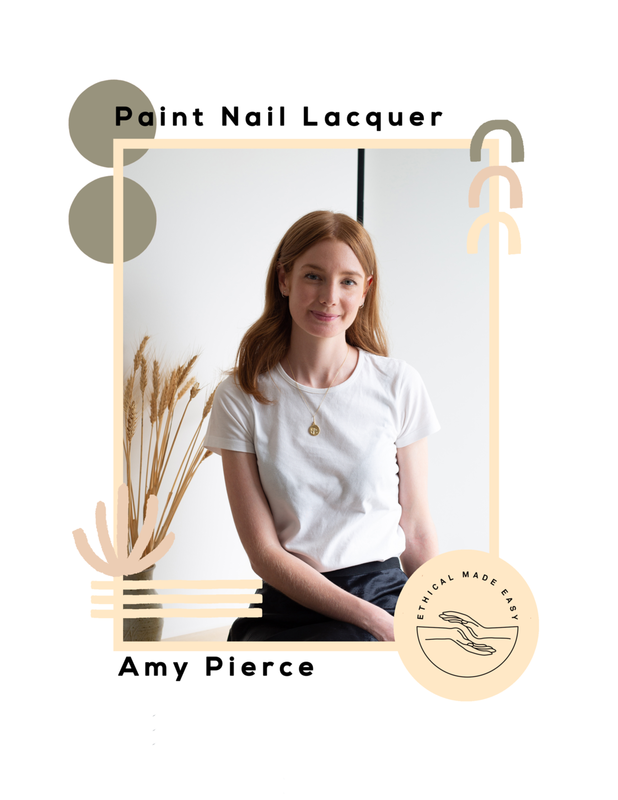 What started from a woman’s love of colour has blossomed into a nail polish range that is clean, minimalist and classic, making Paint a product that you definitely need to get your hands on—and get onto your hands as well. An interview with Amy Pierce, the founder of Paint. What made you start Paint? Paint was born because of my love of colour. I am an interior designer and when I was working on projects and using the paint fan decks I would often find myself wishing I could have this specific shade in a nail polish. From there I combined my interests of colour, design and beauty. Paint is a creative platform for me to express myself. It brings me so much joy and satisfaction to continually grow and evolve my brand. I love being able to create a design aesthetic tailed to my personal style and sharing this with my customers and collaborating with other creatives. Thinking of ways to stay unique but approachable in a market that is saturated with great products. Within the ethical fashion community, there's a big question that we ask which is 'who made my clothes?'. In the scope of Paint, who made your Nail Polish? Can you tell us a bit about them? Paint is made in Australia by an Australian owned manufacturer. I have a close relationship with my manufacturer who spends a lot of time helping me to bring my colour visions to life. They are innovative and driven by reducing any impacts of their products, and they've even perfected an oxygen and water permeable formula. They are also dedicated to improving the ingredients we use and trying to find new ways to make the product more sustainable and better for our customers! As an interior designer I spend a lot of time working with colour and colour forecasts. Through interior design I am able to gain an additional perspective outside of the beauty and fashion world. The Paint range is small and considered, consisting of classics and carefully selected on trend colours. To trust that if you believe you can do something, you can, and it's achievable. There is a growing awareness in society for ethical choices and standards and I needed Paint to comply if I was going to release a product that I am proud of. This is also the reason that it had to be cruelty free, 10-free and made in Australia. The core principles I had in mind when starting Paint were high ethical values and standards, a quality product and, of course, design and colour. When you prioritise ethics, you may have to compromise financially. However if you're passionate about doing things right, you are able to focus on the bigger picture for your brand. Action. Don’t overthink an idea for too long, just start with action and the rest will follow. I find it very helpful to speak with likeminded people with similar projects to gain additional advice. Social media is such an amazing tool for this. Don’t be held back by the fear of making mistakes as these are the most valuable learning tools and often a catalyst to move forward. Where do you envision Paint in the future? This next year I plan to collaborate with a new creative each season. I plan on approaching people from many areas of design ranging from beauty stylists to fashion blogger designers, furniture designers, interior designers, artists and even the food/ hospitality industry. I think this broad range of expertise will bring something really unique to my brand. I'm really excited to have Paint stocked at the National Gallery of Australia in Canberra and to be part of their current design exhibition. We have also started researching a recycling program for our bottles! Working in a creative environment is a great source of inspiration. I look to other interior designers and architects. I love local designers such as Tamsin Johnson and artists such as Den Holm and Bobby Clark. As I still work full time as an Interior Designer, I like to make a strict schedule for Paint to ensure that my brand is progressing and expanding while keeping up with the demands of running the physical side of the business (processing orders, admin, accounting, etc). I now have Ali working with me to help out. She's great, keeps me inspired and on track and also has an amazing design aesthetic. At the beginning of the week we schedule social media posts and ensure we have enough content to keep our audience engaged. We try to meet weekly to make a list of everything we want to achieve for that week. The Subtle Art of Not Giving a F*ck. It's light but really informative. Essentially the message is that we need strategies to cope with the inevitable peaks and troughs of life, to reassess our values as there are only so many things we can care about and need to fine-tune the ones that really matter. Innsaei (currently on Netflix). This is about renowned thinkers and spiritualists who discuss the Icelandic concept of innsaei, which enables humans to connect through empathy and intuition. It explores how in our modern world we spend so much time outwardly reaching and how important it is to look inward, stay grounded and be in tune with our inner knowing and intuition. Mari Andrew. She is a writer, illustrator and speaker based in NYC. From Ali - there are so many amazing sustainable, ethical and positive female Movers & Shakers out there at the moment! Lauren Singer from Trash is for Tossers, Amanda and Charlotte from Bob in Melbourne, Cat from Good Times Pilates in Fitzroy and Nicole from Tribe Natural Beauty in Bronte.